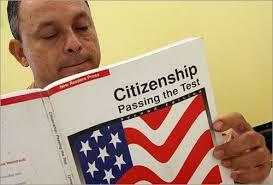 Home Blog Immigration Law What Is The Naturalization Test? What Is The Naturalization Test? In order to become a naturalized citizen of the United States, it is imperative that you pass the Naturalization Test. At your Naturalization Interview, you will first be asked questions about your application, your personal history, and your immigration background. You will also be required to take an English language test and a Civics test which assesses your knowledge of U.S. history and government. The English component of the test consists of speaking, reading, and writing. For the reading component, you must read aloud one out of three sentences correctly. For the writing test, you will be asked to write one out of three sentences correctly. The Civics test is an oral test, not a multiple choice test, in which the immigration officer will ask you up to ten questions from a list of a hundred questions in English. You must answer six out of the ten questions correctly in order to pass the civics test. Certain applicants, because of age and time as a permanent resident, are exempt from the English requirements for naturalization and may take the civics test in the language of their choice. It is also important to know that some individuals may qualify for a testing exemption or waiver when they are unable to study for or pass the examination, due to personal circumstances. For information on exemptions and waivers, please contact the Shulman Law Group, LLC to schedule a consultation appointment. Our immigration attorneys have helped many individuals to obtain exemptions due to disabling conditions, such as developmental disabilities, physical or mental impairments, and neurocognitive dysfunction (e.g. progressive memory disorders such as Dementia or acquired brain injury such as Strokes). We assist our clients by facilitating referrals to medical providers who are able to complete the required N-648 Form, a certification for Disability Exemptions. We also assist these clients by attending their Naturalization interviews in order to advocate for their exemption needs.